Director Danny Boyle seems to have no firm grasp on what he’s trying to say about Apple co-founder Steve Jobs in the new film, rather unimaginatively titled Steve Jobs. Boyle flexes his customarily well-toned stylistic muscles throughout the film and Aaron Sorkin’s screenplay is loaded with razor-sharp dialogue. Daniel Pemberton’s score pulsates urgently throughout, helping to add tension to what amounts to two hours of people arguing. And it’s all very entertaining and almost overwhelming on a purely sensorial level. Unfortunately, Boyle and Sorkin don’t provide a means to understanding Jobs on anything other than a superficial level. He apparently could be a real jerk, we’re shown, but he came up with a lot of brilliant ideas. Structuring Steve Jobs around the auditorium/audience-based launch of three different PCs in three different eras is a boldly unconventional way to approach a biopic, but it’s only partially successful. For one thing, the product launches get progressively less interesting. The opening act (Steve Jobs could’ve just as easily worked as a stage play) focuses on the 1984 launch of Apple’s Macintosh computer. Jobs (Michael Fassbender) wants total darkness, with even the green “exit” signs in the auditorium turned off (against fire code, he’s told). He needs the computer’s voice demo to begin by greeting the audience with a simple “hello,” but his team isn’t sure it’ll work. 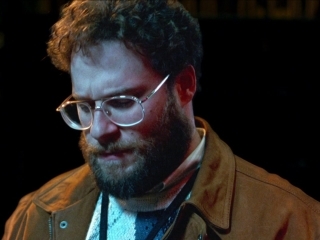 Here we meet the film’s principle players, including Jobs’ stalwart assistant Joanna Hoffman (Kate Winslet), Apple techie Andy Hertzfeld (Michael Stuhlbarg), and Apple co-founder Steve Wozniak (Seth Rogen). Wozniak wants Jobs to acknowledge the success of the team behind the Apple II home PC, but the uncompromising Jobs feels it will distract from the Macintosh launch. 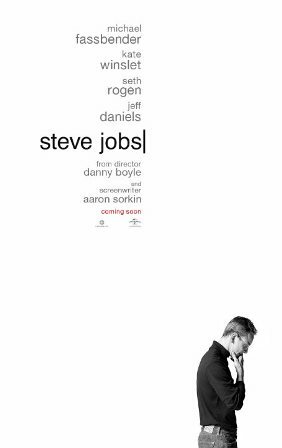 This is where we get the clearest idea of Boyle and Sorkin’s vision of Jobs’ particular brand of genius. As portrayed by Fassbender (who delivers a complex, layered performance – all the more impressive given the limitations of the storytelling approach), Jobs seems baffled that anyone wouldn’t be in total agreement with him. He’s arrogant, but he appears to be right – even when he’s wrong. His mistakes are mere stepping stones to the next breakthrough. Amidst the tension, we’re also introduced to Chrisann (Katherine Waterston) and her five-year-old daughter Lisa (portrayed by three actresses at different ages; here it’s Makenzie Moss), who also happens to be Steve’s daughter. He won’t cop to it, even though he seems to realize it’s true in his heart of hearts. Jobs’ relationship with Lisa forms the film’s emotional core. It’s a shaky one, at best. Prior to the Macintosh presentation, his interactions with the five year old range from dismissive to intrigued to impressed (young Lisa proves the Mac’s intuitive design by effortless “painting” an abstract picture using the computer). Again, it’s the first product launch segment that works best, as Lisa’s appearances (she always seems to be waiting in the wings at every such event) grow increasingly perfunctory. The opening act is densely layered and thrilling. The characters huff and puff at varying levels of intensity, with Winslet’s Hoffman the calm at the center of the storm. But instead of providing a bravura setup for what’s to come, it winds up also serving as the film’s premature climax. Boyle and Sorkin follow the Macintosh launch with Jobs’ 1988 launch of the NeXT computer – a “perfect cube” (that’s not quite perfect), conceived as competition for Apple, the company that dared let him go. By the time we get to the iMac launch in ’98, Jobs – back with Apple – has mellowed. Fassbender’s performance takes on more subtle shadings as he has morphed into the immediately recognizable, middle-aged incarnation of the visionary. Boyle and Sorkin presuppose that their audience brings a certain common knowledge to the film, staging the ’98 launch as a victorious payoff with only a few brief mentions of Jobs’ yet-to-come innovations (“I’ll put a 1,000 songs in your pocket,” he tells the now-19-year-old Lisa, played by Perla Haney-Jardine, who still carries a bulky cassette Walkman). The film’s weakest point is how unearned their portrait of the kinder, gentler Jobs feels after the tumult of acts one and two. It’s as if Sorkin said, “We’ve only got two hours to work with and everyone already knows Jobs was a genius, so let’s put a bow on his dad/daughter issues and wrap things up.” The rush of the earlier sequences is gone and not replaced with anything nearly as compelling. The formula of having journalist Joel Pforzheimer (John Ortiz), Wozniak, Joanna Hoffman, and Lisa show up to go through largely the same paces at each major launch starts to feel predictable. It’s never tedious though, which is the film’s greatest strength. Between Boyle’s kinetic visual style and Sorkin’s rat-a-tat-tat dialogue, Steve Jobs consistently entertains. It just doesn’t get deep enough inside Jobs’ head to leave us feeling enlightened.